Lodge Spark Plugs newsletter, 1956. Homepage. This page: A single-sheet newsletter given out from the Lodge stand at the Earls Court Motor Show. Elsewhere in this section is a look at the packaging used on Lodge spark plugs in the 1940s and 1950s, and also a pre-war receipt from a garage in Scotland that recommended Lodge plugs to its customers. This page though features a single-sheet newsletter given out by Lodge Plugs Ltd, of Rugby, England, in October 1956 at the Earls Court Motor Show. A small pencil-written note advises when the Show was held (17th - 27th October 1956), and also the date that this newletter was collected from Lodge's stand - Saturday 20th. 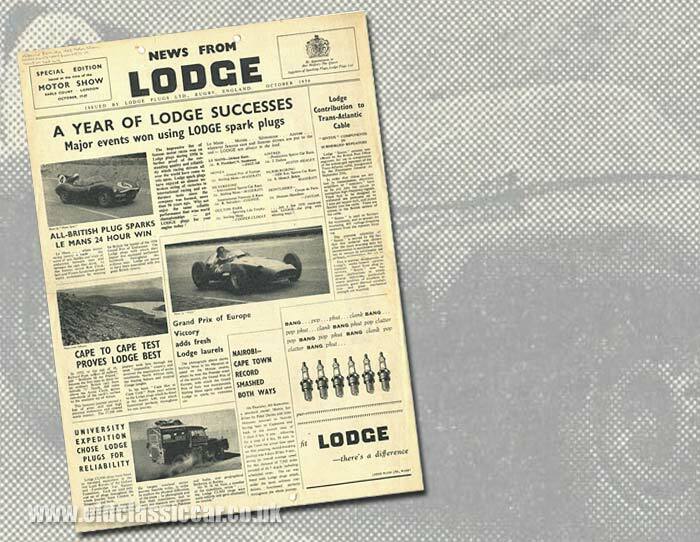 "The impressive list of famous motor races won on Lodge plugs during 1956 is further proof of the outstanding quality and reliability which racing drivers all over the world have come to rely upon. Lodge spark plugs have enjoyed an almost unbroken string of victories in international racing and endurance tests since the company was formed, more than 50 years ago ... "
"Le Mans ... Monza ... Silverstone ... Aintree ... wherever famous cars and famous drivers are put to the test - LODGE are always in the lead." Shown is a photo of a D-Type Jaguar at speed, alongside of which is a list of some events that Lodge were successful at - notably a win for Jaguar at Le Mans, winning the Grand Prix of Europe at Monza (driven by Moss), the 1000km Sports Car Race at the Nurburgring, and the Coupe de Paris at Montlhery, driven by Duncan Hamilton, again in a Jaguar. Endurance tests for Lodge plugs. "... latitude 71 degrees North, 600 miles above the Arctic Circle, across two-thirds of the earth's surface to the southern tip of Africa. This fantastic journey proved a feat of great skill and high personal endeavour and created world interest ... In his book "Cape Hot to Cape Cold" Pape pays tribute to the Lodge plugs which he fitted in his Austin A90, and which functioned perfectly throughout his epic journey." By Land Rover to Singapore. Another article takes a look at a convoy of two Land Rovers driven on the Oxford and Cambridge Far Eastern Expedition, a journey that took six plucky graduate adventurers from a start in London, cross-country to Singapore - and back again. As well as to explore the physical challenges of the route, and film their trip (does the film survive? ), they also wished to carry out research into irrigation projects being undertaken in Pakistan and India, with extra fieldwork in Burma. Of the plugs they used, they were found to be "... quite reliable and gave absolutely no trouble". On 6th September 1956, a lone Morris Isis fitted with Lodge sparkplugs - driven by Peter Davies and John Manussis - did a return trip from Nairobi to Capetown and back, in an overall time of 5 days 3 hours and 8 minutes, although this did include a stop of just under 7 hours in Cape Town. Their average speed was a very creditable 61.7 mph, and while the plugs held up well, no report is given of the car's overall condition after this epic trip. Other information and developments at Lodge. The reverse of the sheet looks at the chromised central electrodes used on Lodge plugs, apparently the only firm to use such a technology at the time, designed to increase the life of a typical plug. Mention is also given to their range of plug caps (available in rubber or bakelite), the Sintox insulation used during the manufacture of spark plugs, and also their range of Platinum Pointed plugs. The remainder of the reverse side comprises a table of popular makes and models of British cars, and the plugs best suited to them - a sobering reminder of just how many British manufacturers there were just a few decades ago. More collectable items like this can be found in the Motoring Collectables section of this site.